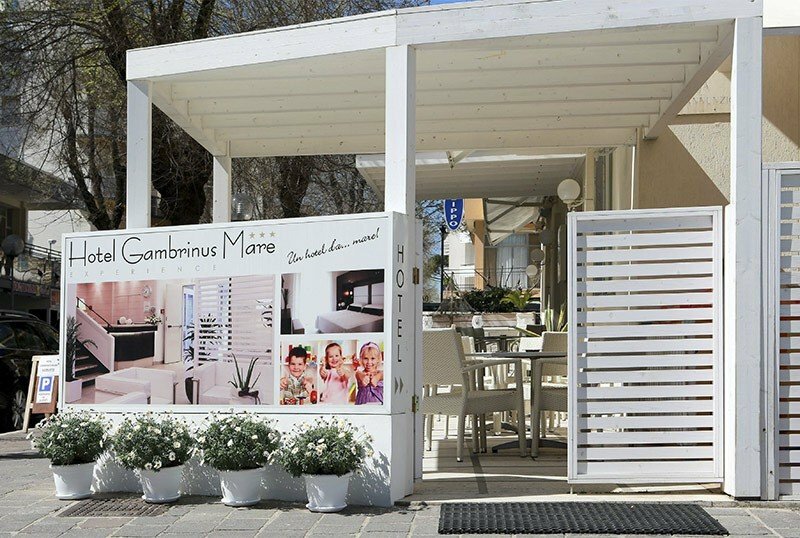 Hotel Gambrinus Mare is a 3-star hotel located in Cattolica, a few steps from the beach. The location is great for walking the Aquarium and the center. Ideal for families, it has facilities for children, themed rooms, a restaurant with show cooking, parking and specific services for cyclists. Admits small and medium-sized pets. The hotel is located in Cattolica, a few steps from the beach and less than 10 minutes walk from the Cattolica Aquarium and the center. All rooms have satellite LCD TV with Sky, DVD player, safe, mini fridge with daily water, kettle with tea and herbal teas, beach towels, toiletries, bathrobe and slippers from rooms, WI-FI, air conditioning. SWEET DREAMS: 20 sqm large with sea view terrace of 16 sqm equipped with hydromassage shower, sunbeds and deck chairs. PETER PAN: inspired by Peter Pan's fairy tale, with themed furnishings and handmade decorations by a local artist. Features 2 balconies. COMFORT PLUS: recently renovated and furnished in modern style, with balcony. FAMILY ROOM: composed of two separate rooms, the master bedroom of 10-13 square meters and the children's room with a bunk bed of 9-11 square meters. It is possible to add a cot, has 2 LCD sat TV, air conditioning, WI-FI, mini-fridge available, safe, fan, hairdryer, slippers from rooms and courtesy set. Terrace, free bikes for all ages, 24-hour bar, elevator, entertainment, beach towels on request, services dedicated to cyclists. Organize theme nights and an aperitif every Sunday. For a fee: laundry, professional carbon bike rental. PARKING: covered and guarded nearby at 400 m with free shuttle. CONVENTIONS: beach, amusement parks (Cattolica Aquarium, Oltremare), shuttle service, organized excursions. PETS: small and medium-sized pets allowed with a supplement of € 4 per day. Area equipped for dogs on the beah affiliated with the hotel. BREAKFAST: buffet with homemade desserts, savory products such as cheese, eggs, cold cuts, bread corner and coffee drinks. LUNCH AND DINNER: show cooking with multiple choice menu with 4 first and 3 second courses, mixed side dishes, hot and cold appetizers, bread and pizza corner, desserts, ice cream, rich wine list. VARIATIONS: vegan and gluten-free cuisine. In hotel: indoor and outdoor playground area, strollers for free use, bicycles with helmets and child seats, baby / mini / junior club, entertainment, afternoon snack, cycling (over 10 years). Pediatrician and baby sitter on request and for a fee. In the room: cribs, camping cots, side rails, night lights, toilet reducer, potty, sterilizer, baby bath, changing table, newborn baby toiletries, bottle warmers, baby monitors. At meals: baby food, baby food , high chairs, cutlery, saucers, microwave oven. At the beach: children's pool, playground area, nursery, baby / mini / junior club, baby sitter, live entertainment. The hotel is equipped for cyclists and has specific services: information corner with maps, itineraries and cycling magazines, reinforced breakfast, garage with bicycle storage, professional carbon bike rental, equipped workshop, self-service bike wash, agreements with shops and specialized workshops, bike manager, expert guide on request for a fee, paid laundry service. 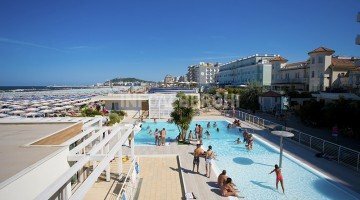 The hotel has an agreement with Malù n. 90/91/92/93, with swimming pool for adults and children, gym, entertainment, mini club, playground area, baby sitter, nursery, playgrounds, pedal boats, area for dogs. Fifth edition of the GRANFONDO SQUALI is part of the TOP TEN of the best GRANFONDO ITALIANE! Sunday, May 12: award ceremony and pasta party! In the rich race pack you will also find a 50% discount for the Cattolica Aquarium!